Um @Apple, the #Mac #AppStore Top Free aren’t all #free !? 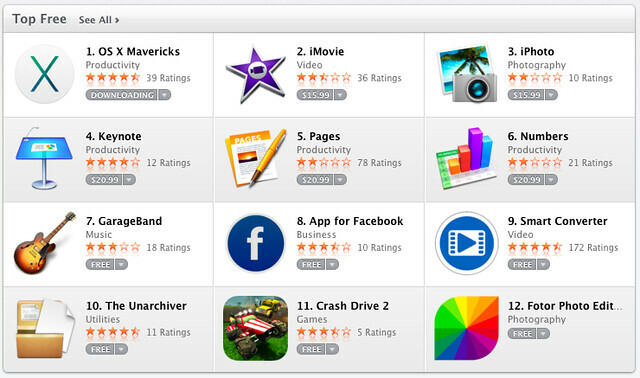 Browsing the Mac OS X App Store today, I noticed that only 58% of the first 12 Top Free Apps are actually free! Is this a miss-classification of applications? A data entry error? Or the Australia tax I get for using the Australian Apple store? The full Top Free list doesn’t have the same problem, past the first 12. I think someone was a little hurried just before Christmas, and ticked the wrong boxes. This entry was posted in Mac and tagged AppStore, free, MacOS X. Bookmark the permalink.